For the past several weeks, Kathie and I have been hearing the characteristic "whistle" of the northern bobwhite. This is not a bird that we had heard before this year, but apparently it has moved in now. Hopefully, to stay. Today, while moving through our White Oak Savanna, I heard this distinctive call very close. Somewhere in this photo, there is a bobwhite quail! According to the Wisconsin DNR, the northern bobwhite is relatively rare in Wisconsin. It is classified as S3, which means it is rare or uncommon. Its protection category is SC/M, which means "special concern/fully protected by the Federal Migratory Bird Act". 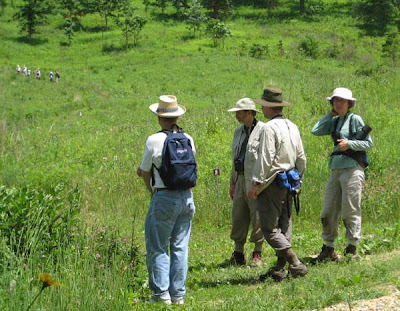 Its preferred habitat is open sites, such as prairies and oak openings. The habitat in the photo is typical oak opening, with large white oaks scattered across the area. The DNR states that use of prescribed fire is beneficial for northern bobwhites, and that bird numbers are significantly higher in burned than in unburned areas. We had an excellent burn in this area in early April. Fire reduces hardwood encroachment and promotes sun-loving groundcover plant species essential for food and cover. Among these species are several tick trefoils (Desmodium sp. 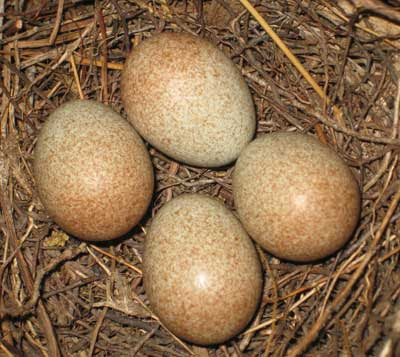 ), which are favorite food of the bobwhite (and quite common in the area shown in the photo). Also of interest is that in May we spent quite a bit of time in the area shown in the photo spraying bramble resprouts. Today (Friday) Kathie and I got up at 5:30 AM and were in the field ready to start work at 7 AM. It was a beautiful time of day. The sun was behind the hills and the savanna and whole south slope at Pleasant Valley Conservancy was in the shade. It was not until about 9 AM that the south slope felt the full brunt of the sun. We decided that we are going to keep that schedule as long as the weather is hot. Why not? All it takes is going to bed early. I spent the whole day surveying my purple milkweed (State Endangered) transplants to see how they are doing. I have been doing transplants since 2006 and now have plants in their first, second, third, and fourth growing seasons. Each transplant is permanently marked and is being followed. Almost 100% of the transplants get through the first summer, provided they are watered when needed. About 75-80% survive the first winter and grow into the second year. Most of those that survive the second year continue through subsequent years. Most plants flower in their third growing season, and by the fourth growing season they look as if they had always been there. In fact, you can't tell them from plants that arose spontaneously. 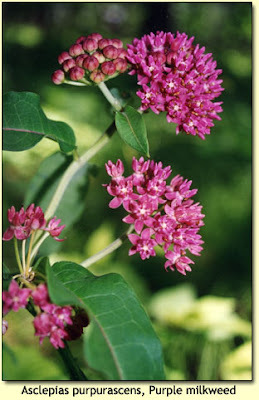 Right now is peak flowering time for milkweeds. Not only purples, but also poke, swamp, butterfly, whorled, short green, and common milkweed are flowering. Compass plant (Silphium laciniatum) has just started to bloom. 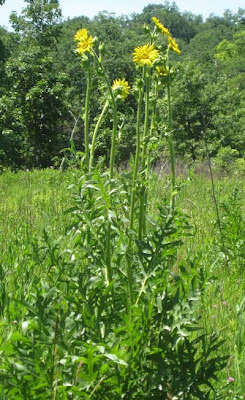 This great plant, one of the fine conservative prairie species (and featured in the logo of The Prairie Enthusiasts), is thriving in two of our planted prairies (Toby's and Pocket), has become well established in the Valley Prairie and is visible as seedlings in two others (Crane and Ridge). Also, it has now become established in open areas of our savannas, although not yet flowering. 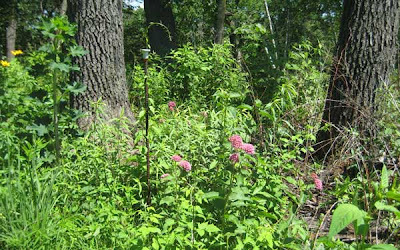 The photo here is from Toby's Prairie, our oldest planted prairie. An individual plant can be long lived, but it does not necessarily flower every year. Kathie and Tom made a few brief remarks (photo above), describing the history of the Conservancy, the importance of fire as a management tool, etc. Despite the weather (the temperature was 95 F in the shade! ), the class forged ahead for their three hour trip/exam. The purple milkweeds are almost in full bloom now. The weather has really cooperated. This year I found another native location (where a stand has developed with no help from us). This makes the 13th location where purple milkweeds developed spontaneously, presumably as a result of our extensive savanna restoration work. In addition, many of the transplants that we set out in 2006 and 2007 are flowering well, and seem to be permanently established. It is encouraging to learn that this endangered species responds well to conservation efforts. The top photo shows a stand that we discovered for the first time last year. This is adjacent to a stand of black oaks, some of which have died of oak wilt (to which they are especially sensitive). This site actually has two separate purple milkweed populations fairly close to each other, both of which have multiple flowering stems. 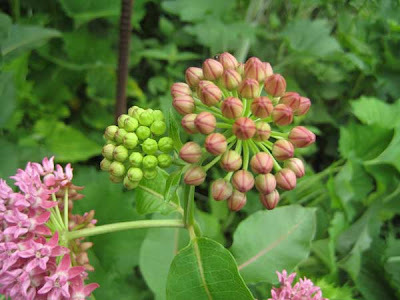 The photo below shows three umbels in various stages of development. 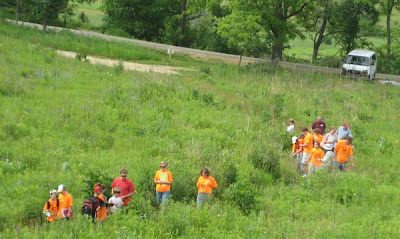 We were pleased to host a field trip for the Southern Wisconsin Butterfly Association on Saturday, June 20. Kathie and I were co-leaders with Ann Thering of SWBA. This trip was sponsored jointly by The Prairie Enthusiasts and Madison Audubon Society. The weather had been rainy for several days, which kept the butterflies down, but the day of the trip had fantastic weather, sunny and not too hot. The butterflies really cooperated, and trip participants were very pleased. 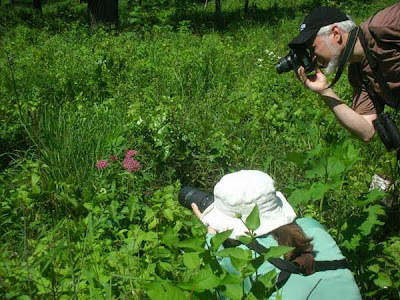 The photo below shows a couple of participants photographing a fritillary among flowering purple milkweeds. Purple milkweed (State Endangered), fairly common at Pleasant Valley Conservancy, was in the early stages of flowering. The species list below was provided by Ann. In addition to butterflies, the participants had the opportunity of observing a colony of Ichneumonid wasps that had set up housekeeping in a dead tree near our cabin. These complex creatures were drilling neat holes into which they were laying eggs. The egg depositing mechanism of these creatures is quite complex and fascinating to watch. This is the third summer that Pleasant Valley Conservancy has hosted the UW Madison Biocore Summer Science Camp. 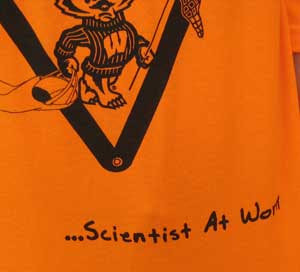 This project, centered on the Wisconsin Heights Schools, has the goal of inculcating scientific method for Middle School students. The official title is Biocore Outreach Ambassador Program. 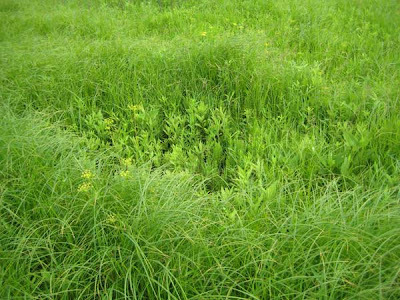 There are several science categories, one of which is Prairie Restoration Ecology. In addition to learning about prairie biology, each student carries out a specific research project. Many of these projects are centered on prairie insects, an ideal focus for these young learners. This year the program also has a component for K-12 teachers. The teachers work and observe the Middle School students in the mornings, and then stay for the afternoons to discuss in some detail the lessons learned. Spiderwort (Tradescantia ohiensis) is now at peak flowering. This intensely blue flower is very attractive, although on a sunny day all the flowers have closed by noon. Cloudy misty days are great for spiderwort, as flowers remain open all day long. At Pleasant Valley Conservancy we have native populations that persisted along the road cuts even before we began restoration. We also have a large open savanna area where they have been flourishing ever since we began clearing. 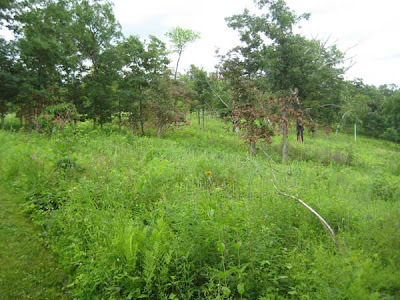 This was an area heavily infested with black walnut trees that we cleared in the winter of 2000. The following summer spiderwort was flowering everywhere. Checking the literature, I discovered that spiderwort is resistant to the toxic chemical (juglone) produced by black walnuts, which explains how it was able to persist in this degraded area. It has continued to flourish in this area, and with the great controlled burn we had this year, it is in prime condition. Another interesting habitat for spiderwort is railroad ballast. This soil-less substrate that the railroad puts down between the ties would seem completely sterile, but for some reason spiderwort grows profusely here. Many stretches of the Wisconsin & Southern Railroad track between Middleton and Black Earth are at the moment bright blue (in the morning). It is really impressive to see this attractive plant growing right out of bare pebbles! 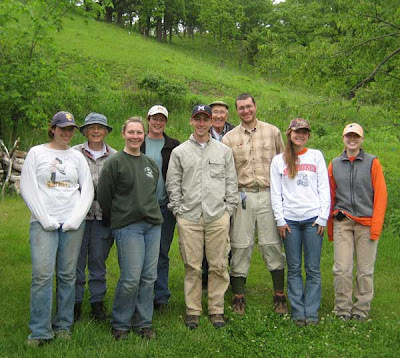 Many prairie restorationists are at the moment in the throes of eradicating sweet clover, one of the most persistent and annoying invasive plants. There are two species, Melilotus alba (white flowers) and M. officinalis (yellow flowers). The latter flowers about a week before the former, and both species can be found at a single site. It is a biennial, but it is only the second year plants that are visible enough to eradicate easily. The two sites that Kathie and I manage, Black Earth Rettenmund Prairie and Pleasant Valley Conservancy, both have lots of it. Despite detailed control efforts over the past six or seven years, it still remains a major problem for us. 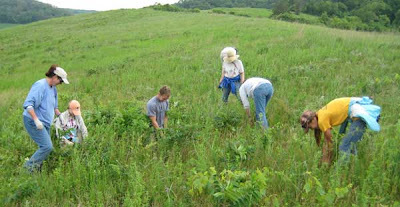 The photo below shows our interns and employees working on a particularly large patch at Black Earth Rettenmund Prairie. We spent the whole afternoon here and are not even close to finishing. A major reason that sweet clover is so troublesome is that its seeds persist for many years in the soil. Interestingly, fire plays a major role in breaking seed dormancy. Many natural areas that have not been burned for some years suddenly become heavily infested in the second year after a burn. Unfortunately, the method of choice for control of sweet clover is hand pulling. It is best pulled when the soil is moist, and it is essential that the whole plant, root and all, be removed. A two-handed pull is best, grasping the stem near the base and slowly pulling the whole plant out of the ground. If the whole root is not removed, dormant buds will grow. If the ground is too dry for easy hand pulling, a shovel must be used to cut the root well below the surface. The photo to the left show what the root system looks like. 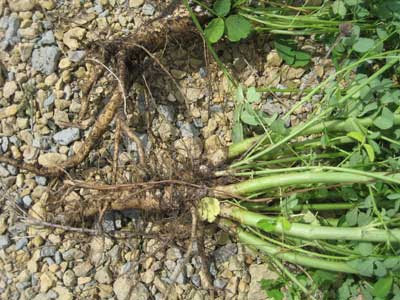 This photo also shows that many sweet clover plants are multi-stemmed. Cutting with a brush cutter can be used for patches of sweet clover too large for hand pulling. However, timing of cutting is critical. It is essential to wait until the patch is in full flower, at which time most of the energy is in the stems. However, if the patch is cut too late, mature seeds may already have been made. Further, flowers in their later stages can continue to make mature seeds even after being cut. Because the goal of eradication is to prevent new seed formation, it is essential that every flowering plant be removed. This requires careful work; persistence is essential. Unfortunately, sweet clover also exhibits fall regrowth, and most of these plants flower. They are much smaller than those seen in the summer, and have fewer flowers, but they still must be dealt with. 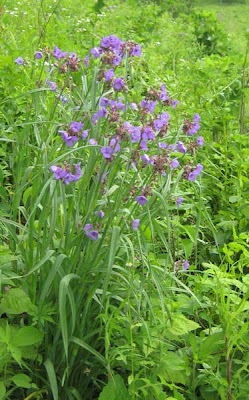 At Black Earth Rettenmund Prairie we usually see these plants when we are collecting seeds of good plants. At times, we spend more time pulling fall-grown sweet clover than collecting seeds. So far, I have never worked on a site where sweet clover has been completely eradicated. In an earlier post I discussed the hemiparasitism of wood betony and how it often acts on prairie grasses. I have now found a similar phenomenon in the related species lousewort (Pedicularis lanceolata), which thrives in wetland situations. I have now found that the clonal sedge Carex trichocarpa, which has been spreading into one of our wet prairies, is being parasitized by lousewort, offering the hope that the sedge will be kept in check. The photo above shows a large patch of the sedge within which there is a distinct "hole" that has been created by growth of lousewort. The photo to the left shows the lousewort plants close up. According to the literature, the small roots of the lousewort are able to penetrate roots of other species and obtain part of their nutrients from them. The hole shown in the top photo indicates how effective this parasitism is. Lousewort in our wetland is a very prolific seed producer and we plan to collect seed this fall and plant among the sedge clones. Black locust (Robinia pseudoacacia) is one of those trees you can love to hate, although because it forms heaps of pretty flowers and a nice perfume, many people love it. It is fiercely invasive and should never be allowed anywhere near a natural area. In our area it usually flowers in late May and the leaves appear soon after. It is a member of the bean family, and really large specimens are often present. One of its worst characteristics is its clonal growth, similar to aspen. It is an easy tree to spot when it is in flower (see the photo above), but once it is finished flowering it simply blends into the woods. 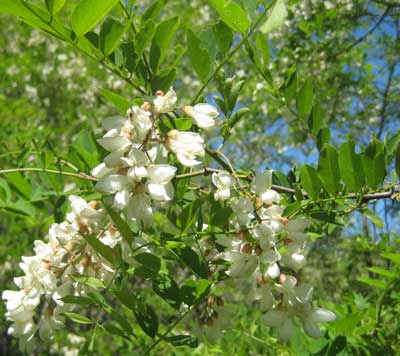 According to the Wisconsin DNR web site, black locust is native to the southern Appalachians and Ozarks but was introduced throughout Wisconsin in the early 1900's because its aggressive growth pattern and extensive root system discourage soil erosion. Black locust wood is also valued for its durability and high fuel value, and provides good forage for bees. However, it forms very dense stands and is capable of completely shading out all native vegetation. It should definitely not be planted in natural areas. 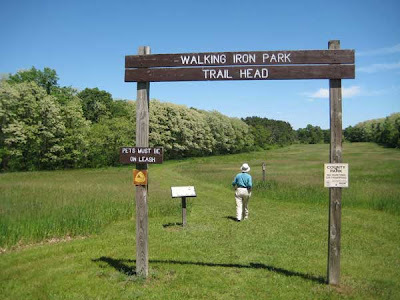 The Prairie Enthusiasts has been battling black locust at Walking Iron County Park for at least ten years. The photo above shows the extensive growth at the entrance to the Park, and there are large stands off Park lands as well. In certain parts of the Park one can find dozens of six foot high specimens. Control can be done by cutting and treating the cut stems with herbicide (triclopyr or chlorpyralid), but because of the large number of stems this is a major job. Kay Bongers has been the lead worker at Walking Iron, and usually has one or two work parties during the winter. If enough people show up, it is possible to eradicate it from one of the areas where it is particularly bad. Fortunately, we don't have any black locust at Pleasant Valley Conservancy. The nearest trees are about 2 miles away, but I have been watching it move from one woodlot to the next over the past couple of decades. Here is what the Plant Conservation Alliance has to say about it: "Black locust poses a serious threat to native vegetation in dry and sand prairies, oak savannas and upland forest edges, outside of its historic North American range....Once introduced to an area, black locust expands readily into areas where their shade reduces competition from other (sun-loving) plants. Dense clones of locust create shaded islands with little ground vegetation. Lack of ground fuel limits the use of fire in natural disturbance regimes." Keep an eye out for it. Don't let it get started in your area! We have now moved into summer work mode. The photo shows our new group of summer interns together with our "regulars". The only person missing in the photo is Kathie, who was behind the camera. This is the seventh year we have had summer interns. 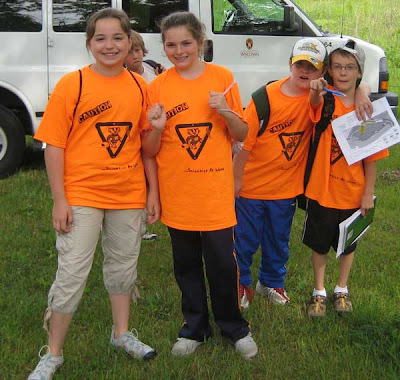 For the past three years we have been part of a group called the Prairie Partners, administered by Madison Audubon, which this year also includes the Prairie Enthusiasts, Pheasant Branch Conservancy, the UW-Madison Lakeshore Preserve, and Goose Pond Sanctuary. 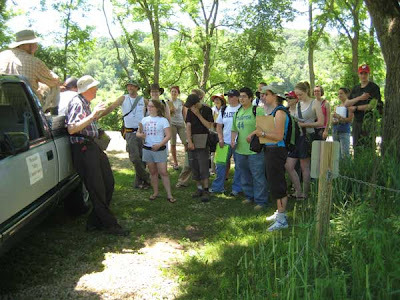 The interns rotate through the five sites, and are at Pleasant Valley Conservancy on Tuesdays. We really enjoy having the interns, and they always accomplish lots for us. This summer, as always, they will be concentrating on invasive weed control, which for us means primarily sweet clover. In addition to their work at Pleasant Valley Conservancy, they will also be working at Black Earth Rettenmund Prairie, another State Natural Area that Kathie and I manage for the Prairie Enthusiasts. The intern work at both sites is funded by our Savanna Oak Foundation, Inc.
One of the "joys" of spraying buckthorn resprouts is that it keeps your eyes firmly fixed on the ground. While spraying in the savanna I flushed a brown thrasher. Since it came from a rather dense leafy area, it seemed likely he (she) was on the nest. Kathie and I returned a while later and flushed him again. It was a simple task to follow the flight path back to the ground, and there was the nest. 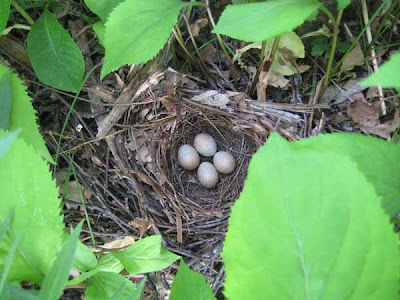 They had built their nest in among a large clump of zig-zag goldenrod. This plant species is characterisitic of open oak woodlands (savannas) and is widespread at Pleasant Valley Conservancy. 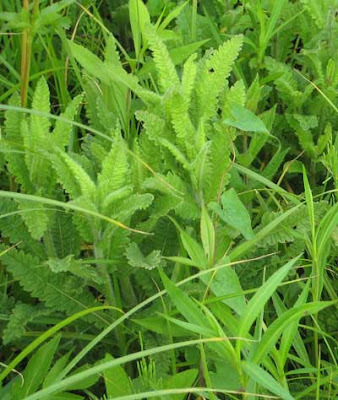 It is an interesting plant since it is one of the earliest species to appear above ground in the spring, but does not flower and set seeds until October. According to the Atlas of Wisconsin Breeding Birds, the future of the brown thrasher bears watching. Although this species is common across the state, breeding bird survey data show that it may be declining. We've been spraying buckthorn resprouts all week, taking advantage of the small size of the clumps to selectively hit them without affecting "good" plants. However, this phase of our work is just about over, as not only are the resprouts getting fairly large, but good plants are now interfering. My surveys show that over the past year we may be finally starting to get on top of this difficult invader. It is taking a lot of work, and we are a long way from finished, but several of our savanna areas are now virtually "free" of buckthorn. Continuing monitoring will be necessary, at least for the next five years (if not longer).